Herramme ja Vapahtajamme Jeesuksen Kristuksen armoa ja rauhaa ja meidän esirukouksemme, siunauksemme ja anteeksiantomme teille kaikille. ”Hyveitten kilpakenttä on avoinna, te jotka haluatte kilvoitella, käykää sisälle." Konstantinopolin ekumeeninen patriarkka Bartholomeos I. In our struggle to achieve “likeness” to God, for which we were created, namely holiness, the one, holy, catholic and apostolic Orthodox Church, which aspires exclusively and solely to our salvation, “rightfully proclaimed” one season as a period of special prayer and supplication in order to calm the passions of our soul and body. 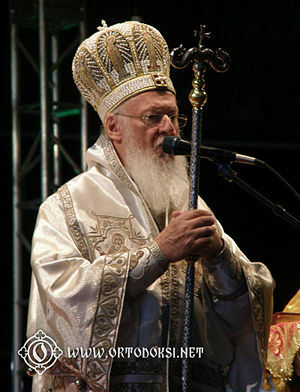 Wherefore, we urge and beseech you, as the spiritual father of all our Orthodox faithful throughout the world, to run with eagerness the race that opens up before us tomorrow in the arena of virtues, “neither thinking nor practicing sinful things.” Let us rather walk with God’s grace in order to cleanse our conscience “with the good option” of repentance in the conviction that heaven and earth, as well as all “things visible and invisible” will ultimately emanate the light of our Lord’s resurrection. If we stand and behave righteously “before the doors of the Lord’s temple,” then we shall be vested with the bright robe of Christ’s imitation and be rendered worthy of the “new drink” that comes from the source of incorruption. Then we shall taste the joy of the radiant tomb of the Lord and be swept inside the Church “to the very depths of the altar,” where “the awesome mysteries are celebrated.” May it be so. Sivua on viimeksi muutettu 21. helmikuuta 2015 kello 16.40.